The next day, after a good sleep in, I rented a car to head out and see the island. 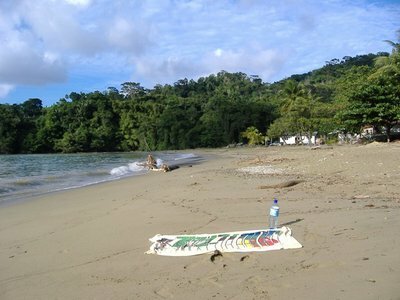 Tobago is small island, only 31 kilometers from one end to the other, but driving there can take a while. 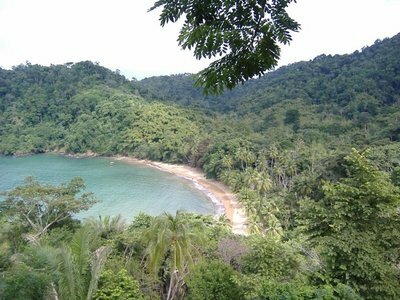 The roads follow the natural contours of the hilly terrain of the island, so roads switch back and forth up and down the rainforest covered hills. I picked up my car, a Nissan Almera at the airport, and opened up the door on the right hand side of the car and took my seat inside. I took a deep breath, putting my hands on the wheel. This was the first time I was ever going to drive a right-hand drive car. 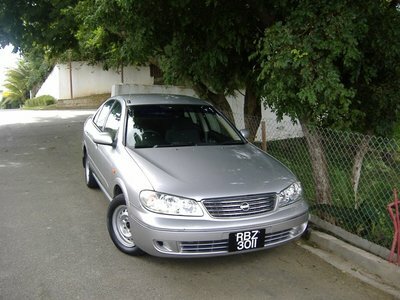 Like many ex-British colonies, Trinidad and Tobago drives on the left side of the road. I was nervous about driving on the right. I reached down and turned on the car, and then without thinking raised my right hand above my left shoulder to grab my seat belt. It wasn’t there. That’s where it would have been in a left hand drive car like we have back in Canada, but here I had to reach up over my right hand shoulder to find my belt. My belt securely fastened, I reached down to put the car in drive, and hit my right hand against the door. I looked to my right to see the door, and then looked to my left to see the gear shift. I was not off to a great start so far. Ten minutes into the drive, however, I was starting to relax. I’d negotiated my way out of Crown Point and made a number of left and right hand turns without smashing into oncoming traffic, so I was starting to feel pretty relaxed. It turns out that driving a right hand drive car wasn’t that hard after all. Heck, millions of Britons do it every day, and some of them aren’t all that bright. If the inbred royal family of England can do drive a right-hand drive car, then it should follow that I shouldn’t have a problem. I drove up along the north coast of the island, which locals call the Caribbean side. After passing by the nice Mount Irvine beach, my first stop was Plymouth. Plymouth is the oldest European settlement and is the host of the international renowned for its Jazz Festival, which last year included acts like Elton John and Gladys Knight. 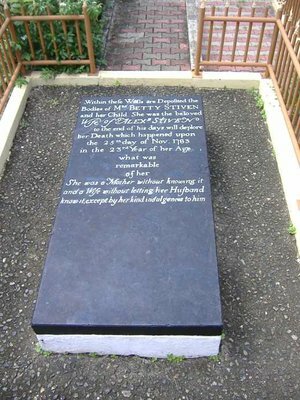 The other thing that Plymouth has is the creepiest cemetery I’d ever seen. 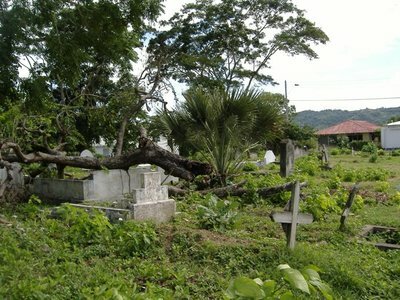 Overgrown with undergrowth, trees toppled over to smash headstones, goats wandering around in the cemetery eating the grass. 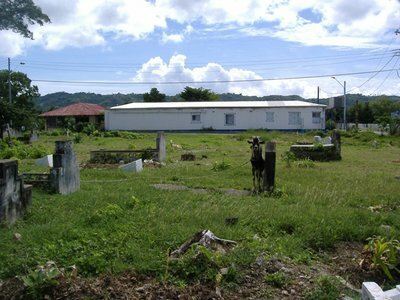 Bear in mind that this is no historically untended cemetery, but a still active and used graveyard. I saw graves from as recently as 2006 in the yard. Imagine it at night, a fog rolling in. 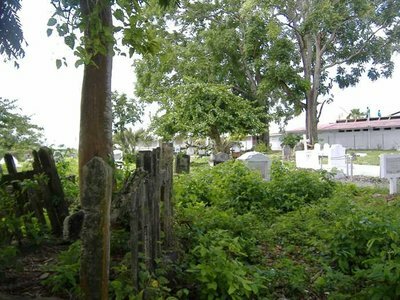 You are walking through the cemetery, tripping through the undergrowth. Soon the fog closes in and you lose your sense of direction. You walk, hands out in front of you to try and feel your way, but find yourself stumbling over a toppled headstone. You hands become tangled in the thick undergrowth as you try and stand when suddenly; you feel the hands of an undead zombie grabbing at your leg. You try and move, but can’t. Your heart races but can’t take the stress and soon fails. Your heart stops, your face frozen in a death mask of shock and horror, the last thought in your mind of the zombies tearing at your flesh. “Heart attack. Strange to be wandering around a cemetery at night.” The chief of police and his deputy walk away as the cemetery caretaker uses his machete to clear some undergrowth and starts to dig a grave for you as the undead zombie that had your leg last nice continues to munch happily on your leather shoes. Goats will eat anything. After leaving Plymouth I had one goal in mind, to find the perfect, deserted beach. As many people who head south from the cold and snow of the Canadian winter, all we want is a little piece of paradise to be alone. We want a deserted beach, all our own. It’s impossible to find in the developed tourist spots like Cancun or the beaches of Varadero, Cuba, where you need to dodge beach chairs and tourists to find a spot to put down your towel. Some of the beaches along the Caribbean coast held the promise of the desired emptiness. After a quick lunch in Castara Bay, I was off to Englishman’s Bay, which was described in 2004 as being a place where no one else was. Arriving though, I find that while the hordes haven’t exactly found Englishman’s Bay, there were a good 10 to 15 other people on the beach and a few food and drink vendors. While it was still possible to find a good spot of beach to myself, it would be impossible to not see other people, so I moved on. Parlatuvier Bay was nice, with no other tourists in town. As fishermen cleaned their daily catches and school children learned how to play Christmas carols on the steel drums, I took a quick dip in the ocean. It was nice, but I was basically swimming in the backyard of the residents of Parlatuvier, and my protestant work ethic of trying to relax as others worked soon took the joy out of the experience, and so I moved on again. So I went down the road to Bloody Bay, the car slipping and sliding through the muddy bits before coming around a corner to display what I had been hoping for; an empty beach. As I got out of my car, I realized that along with the road, the facilities at Bloody Bay were also under construction. There were 3 half-built buildings on the grounds, and the sounds of hammering could be heard from inside the buildings. As I was standing surveying the long sweep of the beach and trying to figure out if I wanted to take a dip at a construction site, the hammering stopped. The men working soon walked out of the buildings and started cleaning up for the day. A truck came down the hill, and the men piled into the back of the truck. I looked at my watch – 3 o’clock. It must be quitting time. Soon the workers were all gone, and the beach was left to me and an old Rasti who was wandering around the site with his dog. He was either the night watchman or an old homeless dude the slept in the construction trailer at night. Perhaps both. He walked into the trailer and took a seat, leaving the beach to myself. So my empty beach was found. I swam in the warm Caribbean waters for an hour, the only person on the entire length of the beach. Soon the sun was getting low in the sky, and I wanted to get back to Crown Point before dark, unsure of driving at night in a strange country on the wrong side of the road, so I started to pack up. I was about to wrap a towel around myself to change from my swimsuit into my dry shorts when I realized that modesty wasn’t called for on a beach where no one else was around, so I just changed in the open in the parking lot, not a human eye upon me. Generally, I wouldn’t tell you all about this find, saving it for myself for future trips. But soon the construction of the widened road, bathrooms and restaurant will be complete, and Bloody Bay will be, if not exactly teeming with tourists, at least not empty for me. So my next trip will have to be somewhere else where I can find an empty beach to call my own. Leaving Bloody Bay I took the Roxborough-Parlatuvier road through the Main Ridge Forest Reserve. Back in the 1700s, the land proved so fertile that soon the sugar planters were cutting down more and more of the rainforest. The government acted to ensure that some of the natural rainforest was preserved, and in 1765 declared 3,958 hectares as protected, and oldest protected rainforest in the western hemisphere. As I approached the rainforest road, I soon came across a blockage in the road. 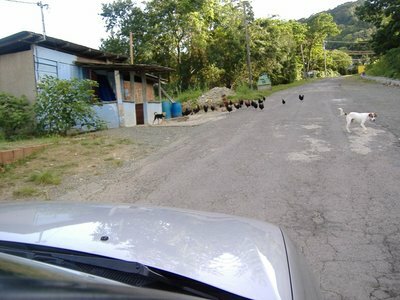 A gang of them, the wild chickens of Tobago, standing in the middle of the road, unfazed by the approach of my car. Sweat covered my brow, would these chickens alight upon me, pecking me to death and devouring my carcass? Luckily, a kindly old farmer happened upon the scene, and threw rocks at the unruly mob screaming at them, “get from the road, get from the road,” until they dispersed. Saved by the kindly local, I waved him a thank you and sped away, before the mob could reform. Friday was my last day in Tobago. I had to catch a flight at six PM back over to Trinidad, and on from there to Toronto, landing on Saturday morning. With a long night of flying ahead of me, I decided to take it easy on Friday. I planned to spend some time swimming and then just liming at a local bar. In Trinidad and Tobago, the word lime is a verb, which means to just hang out. 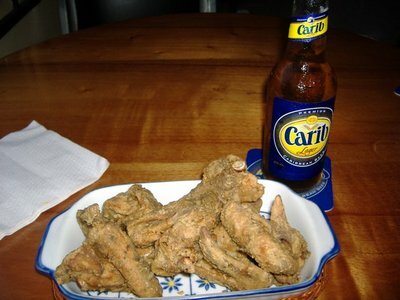 I chose to do my liming at the Land’s End bar along the Pigeon Bay road. I took a seat on the patio, sipping on Caribs and watching as the waves crash against the sea wall and splash up onto the sea-side patio. Soon the day has ticked away, and I need to head to the airport, taking one last chance to walk along the beach, enjoying the feel of sand between my toes before having to wear winter boats back in Toronto. After showering and checking out of Mike’s Holiday Resort, and went to check in to my flight to Tobago. After getting my boarding pass, I still had an hour and a half until the flight, so I went to the nearby Cutter’s bar and restaurant for a beer and some dinner. I looked over the menu and saw the ideal meal. After being tormented by them all trip long, there on the menu was my payback. The plate arrives, 6 wings, deliciously fried. Forget everything I said earlier about the best meals being the local food, or even the two AM greasy meal, the best food is REVENGE food. Not only did I get my retribution on those that tormented me throughout my trip, but I also made things little bit safer for the next group of tourists, who will have 3 less wild chickens of Tobago to deal with. Love those cemetery pics - must add it on my list of must-sees! Loved your blog, as always.